Breakfast is my favorite and least favorite meal. As far as types of food go – bagels, omelets, smoothies, cereal, waffles (really, any brunch item) – it’s my favorite meal of the day. But during the week I don’t have the time to make the food that’s going to fuel me up to start my day and whatever I eat only keeps me satisfied until about 10 am. No good. Over the past week I did some digging to find, make and test the quickest breakfast solutions. 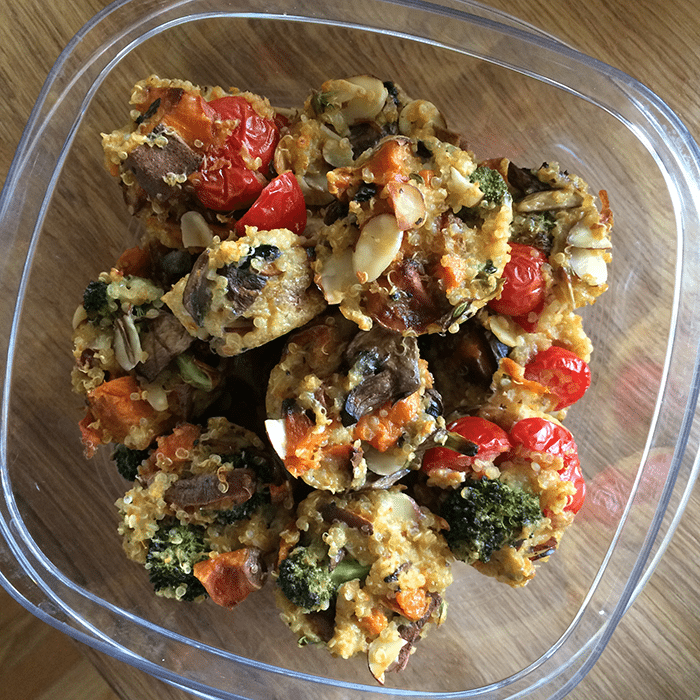 Today I’ve got seven grab-and-go breakfast ideas for you! For each recipe, I used coconut milk, but you can substitute your milk solution of choice and get creative with any of the added toppings (fruit, nuts, spices, sweeteners, granolas). 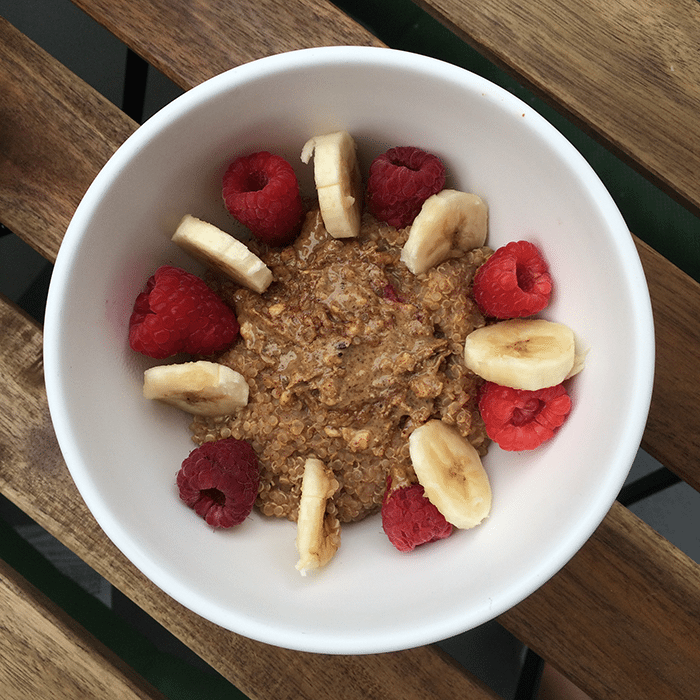 Did you know quinoa and oatmeal can be used almost interchangeably? Cook quinoa like you would if you were to make any savory recipe (1 part quinoa to one part liquid), but instead of using water add coconut milk, some cinnamon and nutmeg. 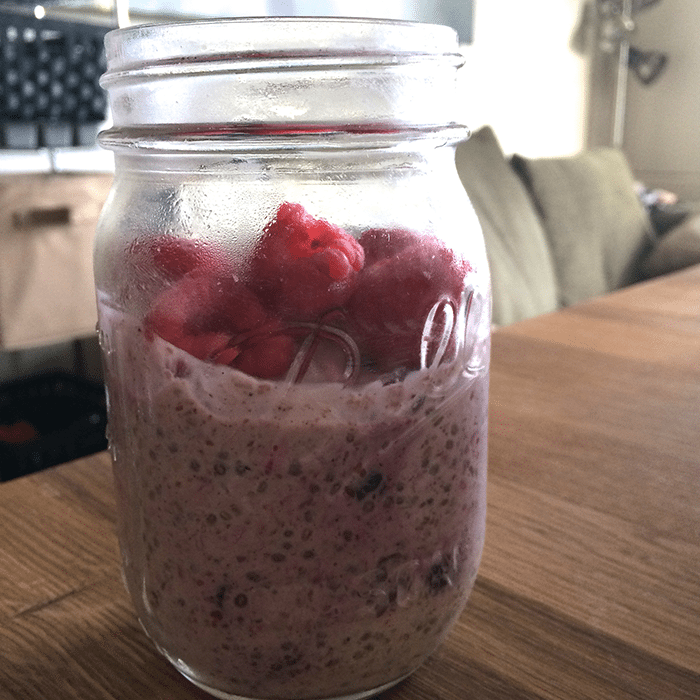 Then, pack it up in a tupperware or mason jar with a dollop of almond butter on top, some raspberries and banana slices. Cook your quinoa using your savory method of cooking (one part quinoa to two parts liquid). Chop and roast your veggies (I roasted broccoli, sweet potatoes, eggplant, and mushrooms). Pour everything into a mixing bowl and add two eggs, salt, pepper and your choice of herbs (I used fresh thyme). Shredded cheese and cherry tomatoes are optional. Place spoonfuls into muffin tins and bake at 350° for 15-20 minutes or until the edges of the muffins are golden brown. Now you’ve got breakfast every day of the week – and if you’ve got extra roasted veggies you’re set for salads for the week. This is the easiest breakfast by far. Chop up a green apple into bite size pieces and throw in a container or Ziploc bag. 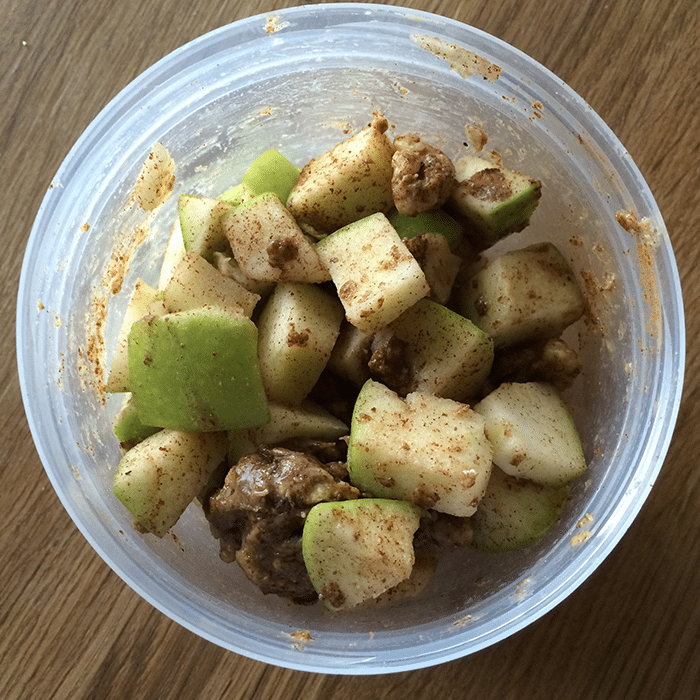 Shake cinnamon over, add a spoonful of almond butter and add some extra chopped nuts (I used cashews and walnuts). Shake the container until evenly coated. Voilá! My favorite dessert just became a breakfast. 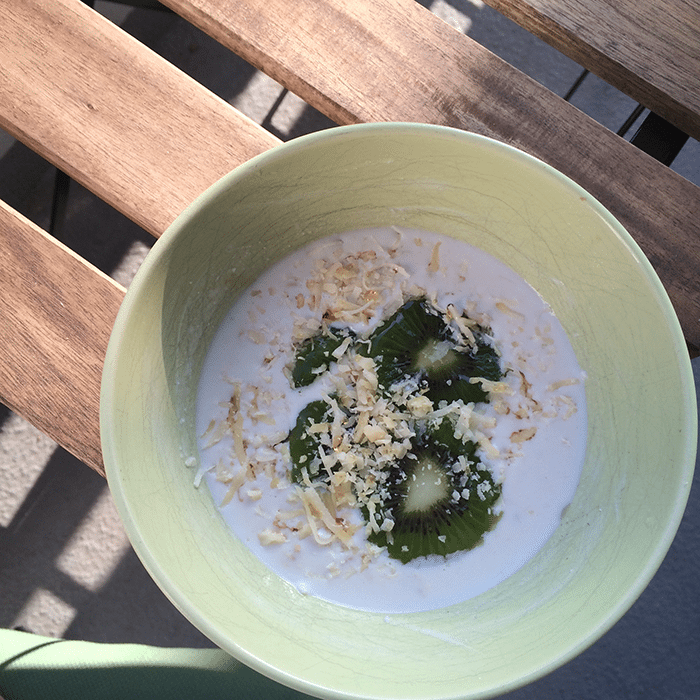 In a jar you can take with you, mix in 1/3 cup oats, 1/3 cup coconut milk, 1/3 cup plain greek yogurt (your basis for any overnight oats recipe), and additionally the zest and juice from 1 lime. If Trader Joe’s had Key Limes I would’ve gone that route, but you make do. And the lime zest surprisingly made a lot of difference to me! Then add 1 teaspoon coconut extract and let it set up overnight. In the morning, add some toppings (I used shredded coconut and kiwi slices) and you’re on your way. I’m getting crazy with the lemons and limes here, but this seriously is unexpectedly delicious. In your to-go cup or jar, add your regular overnight oats ingredients (1/3 cup oats, 1/3 cup coconut milk, 1/3 cup greek yogurt), this time using blueberry greek yogurt along with 1 teaspoon vanilla extract, 1 tablespoon chia seeds, 1 tablespoon flax seeds, and if you want to add some frozen blueberries, go for it. Stir and let sit overnight. In the morning, add fresh blueberries (I only had raspberries), nuts, and granola and get going! 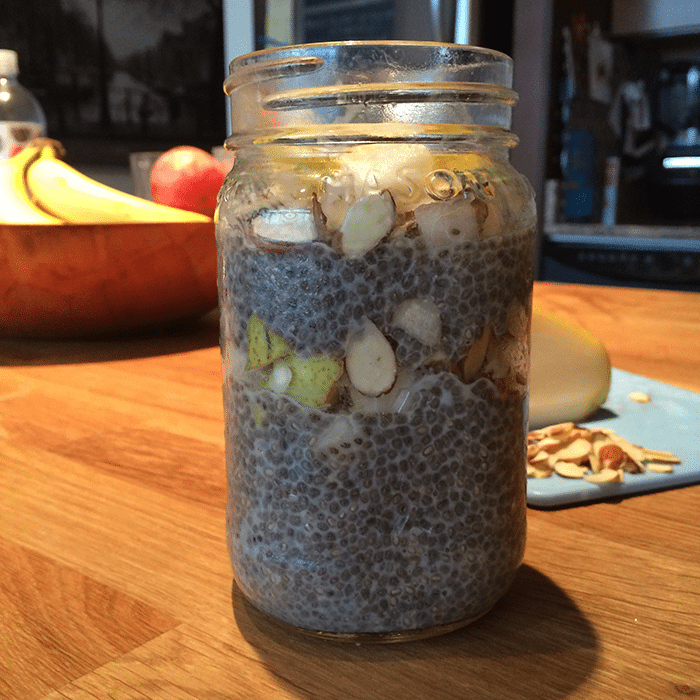 I’ve been on the overnight oats train for a while, but Chia seed pudding is quickly changing my life. Simple chia seed pudding is 1/3 cup chia seeds, 1 1/2 cups of coconut milk, 2 tablespoons maple syrup or honey, 1/2 teaspoon vanilla. Combine everything in something with a lid and shake vigorously. Let it sit overnight, take it to work and eat it cold with any fruits and nuts you so desire (I chose pears, sliced almonds and a little honey). 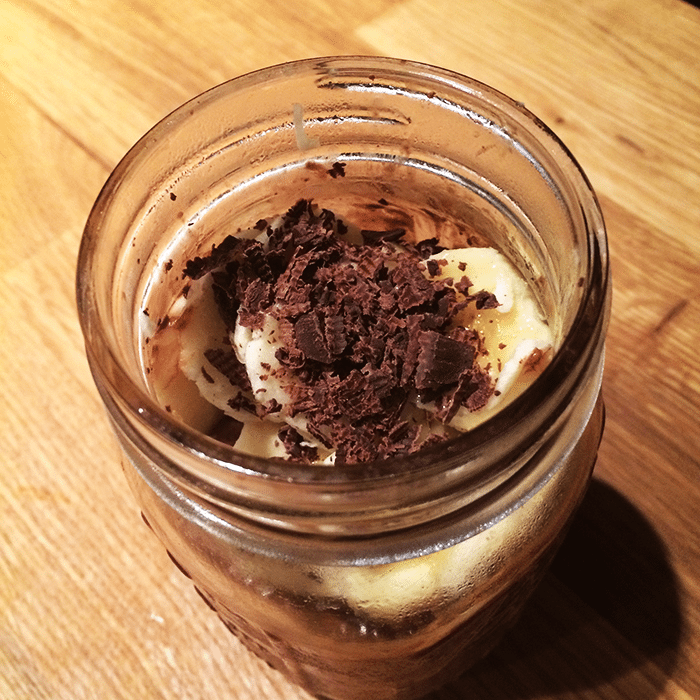 The dessert version of Chia seed pudding, and who doesn’t love chocolate and banana? Add regular ingredients – 2 tablespoons chia seeds, 2 tablespoons maple syrup, 200 mL coconut milk. Also add 2 tablespoons unsweetened cocoa powder and 1/2 sliced banana. Stir, let it sit overnight. In the morning add the rest of the banana slices and some dark chocolate garnish if you want. All of these keep for at least 3 days, so prep them in your to-go jars early and add the extra toppings right before you’re out the door. Hope you enjoy! THESE ALL MADE ME SO HUNGRY. They look amazing!